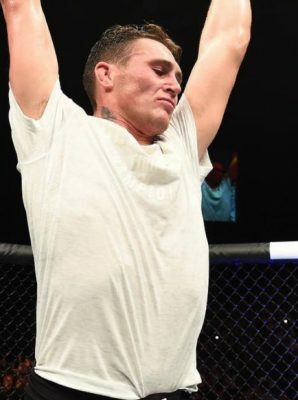 Undefeated prospect Darren Till was asking for a step up in competition and now he’s got it. Till is expected to face Donald “Cowboy” Cerrone in the main event at UFC Fight Night in Gdansk, Poland on Oct. 21. Sources close to the fight confirmed the news to MMANytt.com on Thursday following an initial report from MMAUno.com. Cerrone (32-9, 1 NC) will look to bounce back from two straight losses to Jorge Masvidal and former champion Robbie Lawler in his most recent trips to the Octagon. Despite those setbacks, Cerrone has racked up several impressive wins since moving to welterweight including a nasty head kick knockout against Matt Brown to close out 2016. Till (15-0-1) has remained undefeated since moving to the UFC roster including his most recent performance where he dispatched Bojan Velickovic by unanimous decision in the Netherlands. Afterwards, Till shouted that he wanted to face a top ranked opponent and it appears the UFC was listening by handing him a matchup against Cerrone with the fight slated to headline the upcoming card in Poland. More fights for UFC Fight Night in Gdansk will be announced in the coming weeks.